Gastropub with cinema near Tooting station. 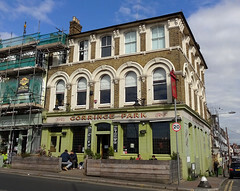 It is owned by Charles Wells Pub Company and operated by the Yummy Pub Company. It sells Charles Wells' brands of beer. It's a large pub with a downstairs cinema and two upstairs function rooms. It also has a garden at the back and tables outside at the front. secretlondon visited with a group one Saturday night in June 2016. The upstairs rooms were booked for a private function and I think Euro2016 was showing in the cinema. There was easy listening background music (the Beatles etc). It has six handpumps although one was off. They were all from Charles Wells — e.g. Bombardier, Young's Gold. The food is at gastropub prices — about £12 for a main. They also sell cake and fancy peanuts on the bar. There is step-free access to the ground floor of the pub, which has a toilet with a RADAR lock. The main toilets are downstairs, as is the cinema and access to the garden. Last visited by secretlondon, June 2016. Last edited 2017-05-10 15:38:59 (version 4; diff). List all versions. Page last edited 2017-05-10 15:38:59 (version 4).